You will feel the electricity as your hair stands on end when you experience this laboratory of sinister inventions. Go with the good doctor and his quirky sidekicks and lose control performing forbidden experiments in the lab where the quackery never ends. 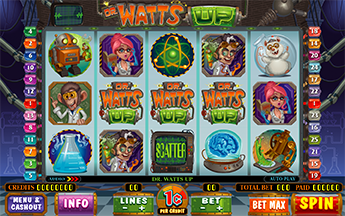 If the Bonus feature is selected you will be prompted to select 3 from 12 test tubes transforming one of the Doc’s loyal rodents into a nice surprise and the chance to win up to 1000x your Total Bet. When the Free Spin feature is chosen, 4-20 Free Spins will be awarded. 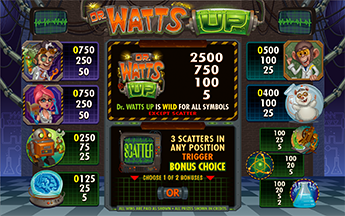 During Free Spins two randomly selected reels become wild every spin. The Free Spin round also allows the chance to retrigger additional free spins.